ELN and Colombian government negotiators meeting in Havana announce that "we have begun study of a cease-fire accord" that would include international verification. Senator and presidential candidate Ingrid Betancourt is kidnapped by the FARC while traveling by land to the former demilitarized zone on a mission to advocate respect for the rights of the zone's residents. The FARC gives the Colombian government one year to negotiate the exchange of Betancourt and five other kidnapped legislators for FARC prisoners in Colombian jails. 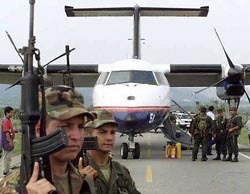 The FARC hijacks a domestic airliner, forcing it to land on a stretch of highway in Huila department. 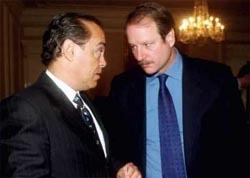 All passengers are freed but one, Colombian Senator Jorge Gechem Turbay, the fifth member of Colombia's Congress to be kidnapped by the guerrillas since June 2001. President Pastrana responds by announcing the end of the three-year-old talks with the FARC. Aerial bombardment, the first phase of military operations to re-take the demilitarized zone, begins at midnight. FARC and government representatives exchange cease-fire proposals. The government proposal calls for maintaining guerilla fronts in small zones to keep them separate from the armed forces. 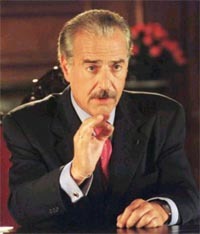 Several presidential candidates, including Horacio Serpa (pictured), Luis Eduardo Garzón and Ingrid Betancourt travel to the demilitarized zone for a meeting scheduled as part of the peace talks' timetable. All candidates sharply criticize the guerrillas' ongoing offensive against civilian targets. A FARC offensive, much of it sabotage of infrastructure and bombings of urban areas, further increases skepticism about the peace process. The Colombian government issues a proposal for a six-month cease fire. The ELN and Colombian government hold a round of meetings in Havana, Cuba. A joint commission is established to draw up a timetable for talks. Shortly before the deadline for expiration of the guerrilla demilitarized zone, the FARC and Colombian government agree to a timetable for cease-fire discussions. The main issues to be discussed are cease-fire terms, kidnapping, and paramilitarism. The document, drawn up with the presence of UN, foreign embassy and church representatives, lays out a brisk schedule that would bring a cease-fire by April 7. President Pastrana extends the demilitarized zone until April 10. 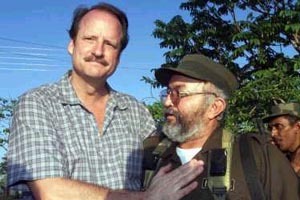 The UN's James LeMoyne congratulates the FARC's Raúl Reyes. In a late afternoon announcement, after a day of efforts from UN, international, and church representatives, the FARC announce that guarantees exist for the peace process to continue, complying with President Pastrana's demand. The January 20 deadline for the demilitarized zone's renewal remains in place, Pastrana says, unless both sides can agree on a strict timetable for cease-fire discussions. Future talks will include international representatives in a more formal fashion. The FARC announce that they will hand over the demilitarized zone's town centers, officially ending the three-year-old peace process. After two days of talks with UN representative James LeMoyne, the FARC releases a proposal for re-starting the peace talks just before the Colombian government's 9:30 PM deadline. 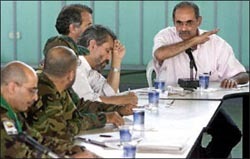 The guerrillas' draft re-affirms the commitments of the October 2001 "San Francisco de la Sombra" accord, but leaves out the question of government controls in the area surrounding the demilitarized zone. The FARC had demanded that these measures be lifted in order for talks to continue. To most observers, the statement tacitly acknowledges that the FARC has yielded on the issue of the control measures -- though the guerrilla proposal would create a commission to investigate complaints about the measures. At midnight, President Pastrana rejects the guerrillas' proposal and orders the army to re-take the zone at 9:30 PM on Monday, January 14. Pastrana offers one last hope: that the guerrillas clearly state that the dialogues may continue even with the control measures in place. The UN's Lemoyne and FARC negotiators continued their meetings on January 13. 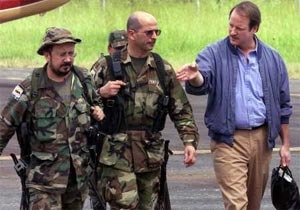 UN representative James LeMoyne arrives in the demilitarized zone in early afternoon for last-ditch talks with the FARC. The two sides have until 9:30 PM on the 12th to find a solution that might save the peace process. Colombian Peace Commissioner Camilo Gómez consults with UN representative James LeMoyne, January 10. As troops mass on the fringes of the demilitarized zone, President Pastrana grants the United Nations time to find a solution to the stalled dialogues with the FARC. If no agreement is reached, the 48-hour countdown for the guerrillas' exit from the zone will begin the evening of Saturday, January 12. 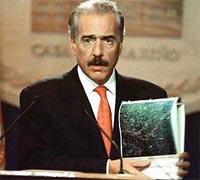 President Andrés Pastrana announces the talks' collapse on Colombian TV January 9. The Colombian government announces the suspension of peace talks with the FARC. The military is to enter the demilitarized zone 48 hours after President Pastrana issues an order (which, as of the afternoon of January 10, he has not done). The U.S. State Department blames the FARC for the talks' collapse. A new meeting between the FARC and Colombian government fails to make progress. 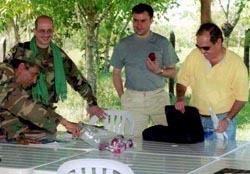 The FARC continues to cite government controls on the demilitarized zone as the chief obstacle to progress in the talks and to the guerrillas' compliance with the October 2001 "San Francisco de la Sombra" accord. In a letter, FARC leader Manuel Marulanda leaves the talks' future up to President Pastrana. He also proposes a timetable, should the present difficulties be overcome: discussion of a subsidy for the unemployed in February and March, and discussion of a ceasefire in April and May. The FARC releases a series of open letters to officials and sectors of society. No progress is made after two days of talks between Colombian government and FARC representatives. The FARC continues to insist that the government lift the control measures it has implemented in the area surrounding the group's demilitarized zone -- activities such as border controls and air patrols that the guerrillas view as tantamount to a blockade. Arguing that the control measures have brought a reduction in kidnappings, the government -- particularly armed forces chief Gen. Fernando Tapias -- has made clear its intention to keep them in place.